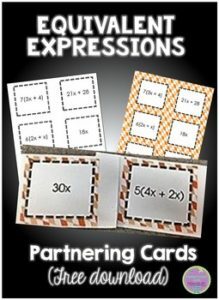 There are 18 sets of cards, so they can be used with classes of up to 36 students. There is a set with a background and a set without, to give you an option when you print. For more practice with equivalent expressions, try Equivalent Expressions Matching, Practice Sheet & Exit Tickets.